We are pleased to offer a wide range of point-of-use tankless and mini-tank water heaters to suit almost every conceivable point-of-use water heating application. Applications in residential buildings include bathroom vanity sinks, kitchen sinks, utility sinks and dishwashers. Commerical applications include bathrooms sinks, staff lunch rooms, emergency eyewash stations, pre-heaters for small dishwashers, restaurants, fast food outlets, caffaterias, hand and hair washing sinks in spas and beauty salons, and any other small domestic hot water heating task. Economical model designed for low-flow point of use applications in warm climates. Very economical. Excellent choice where only 110/120v power is available and water is used infrequently. Space saving design - conveniently mounts under a sink or in a nearby cupboard. Available in 2.5 and 4 gallon tank storage capacities. 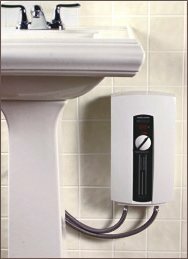 Economically-priced point-of-use tankless water heaters up to 10KW suitable for almost all point of use water heating applications. 110/120 volt and 208/240 volt models available. Best suited to single applications with a relatively consistent water flow rate and pressure. 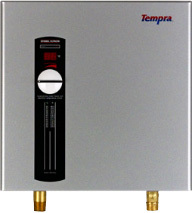 True thermostatically-controlled tankless water heater with full flow-based power modulation. Available in power range up to 10 KW (208/240 volt configuration). Excellent choice for point-of-use applications where flow rates or water pressure may vary due to multiple water demands or well pump pressure changes or where very low activation flow rates are required. Features digital temperature selector. Used mainly for whole house applications, these thermostatically-controlled tankless water heaters feature full flow-based power modulation and can be used for more demanding point-of-use applications where higher flow rates are required. Available in power capacities from 12 to 36 KW. Excellent choice for demanding point-of-use applications where flow rates or water pressure may vary due to multiple water demands or well pump pressure changes. Features digital temperature selector. The chart below will give you some guidelines as to the flow rates of common water demands. It is important to note that the flow rates of these applications will vary due to water pressure and other factors. Accordingly, you are encouraged to test you actual flow rate of your application for a more precise model determination. Once you have determined the flow rate your require, use the map and chart below to determine which models are able to meet your flow rate needs based on your incoming water temperature. It is important to verify that the activation flow rate for the model selected is less than the flow rate of your application or the heater will not activate. * all KW ratings based on 240 volt except for Mini 3 and DHC 3-1 which are based on 120 volts, and except DHC 4-3 which is based on 277 volts.